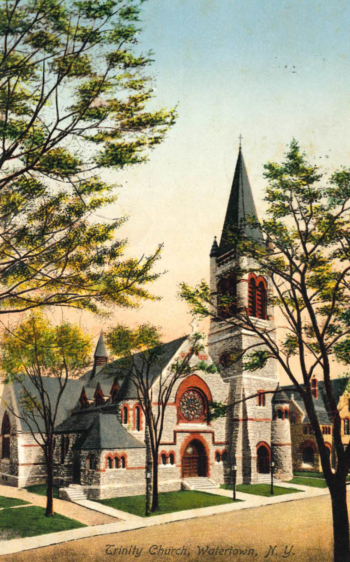 On May 31, 1828, Trinity Church was officially organized as a parish. The first of three edifices in Trinity’s history was consecrated on Sept. 18, 1833. However, the structure, located on Watertown’s Court Street, was destroyed in a fire that swept through the center of the city May 12, 1849. The second church, also located on Court Street, was consecrated on Jan. 23, 1851, at a cost of about $16,000. The wooden gothic structure was the design of architect Richard Upjohn of New York City. Trinity soon began to outgrow its fondly regarded Court Street edifice. 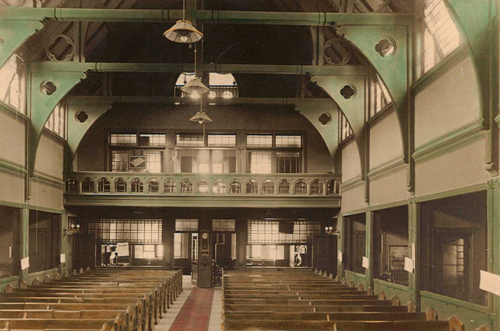 The first of many gifts to Trinity Church from the Flower family came in November 1886, when Anson R. Flower, a communicant of Trinity, gave land on what was then called Benedict Street and much of the needed funds for construction of a new parish house there. Construction on Trinity House, as it came to be known, was begun on May 16, 1887, and the building was dedicated on Shrove Tuesday, Feb. 14, 1888, at a cost of $78,500, according to the original contract. Then, on Jan. 22, 1889, the rector read to the vestry a communication from Anson Flower and his brother, Roswell P. Flower, (former governor of New York and United States congressman), offering to build a new church edifice on land adjacent to Trinity House. Benedict Street was by then re-named Trinity Place between Stone and Clinton streets and later would become a part of Sherman Street. Construction on the present Trinity Church building was begun on April 1, 1889. The cornerstone was laid July 11, 1889, and on Tuesday, Sept. 9, 1890, the new building was consecrated by the Rt. Rev. Frederick Dan Huntington, then Bishop of Central New York. Clinton F. Smith Builders, of Middlebury, Vt., was the construction company, and William Pitt Wentworth of Boston was the architect. Until the construction of the second parish house in 1912, the church’s style closely matched that of the original Trinity House, for which the same W.P. Wentworth had been the architect. 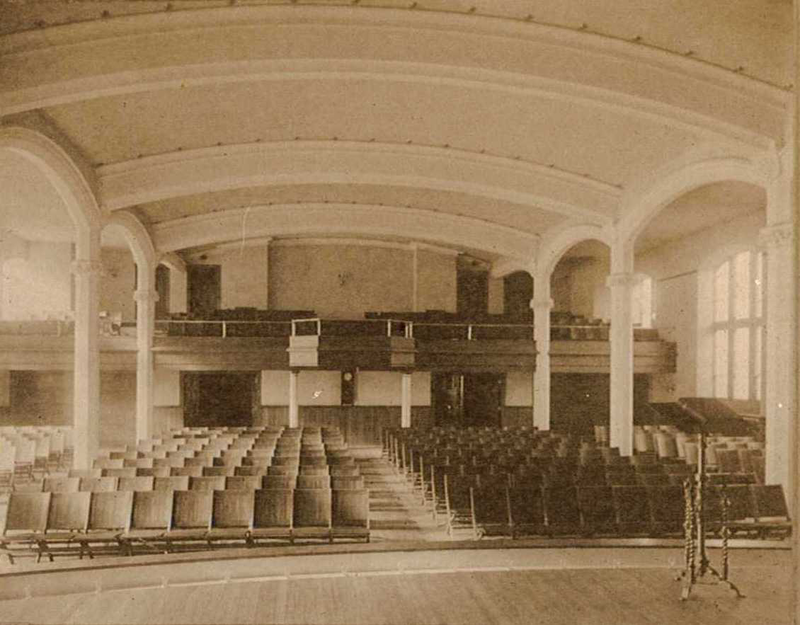 The second parish house, designed by Philadelphia (Pa.) architects Watson & Huckel, served as a social and recreational center for the entire community, and was built with an auditorium, gymnasium, bowling alleys, and swimming pool. A gift of Emma Flower Taylor in memory of her father, Roswell Flower, and uncle, Anson Flower, the second parish house underwent major renovation, remodeling, alterations and redecoration in 1964, at which time the chapel was also redecorated. In 1922, the entire chancel area of the church building was rebuilt to include the present marble altar, reredos, and the chancel and altar rails. Marble tiles were later laid in the aisles, and other redecorations and renovations were carried out. That summer also saw the first of periodic repairs to the church’s bell tower. Two years later, the church received a Skinner pipe organ, which was replaced in 1970 with the present organ, built and installed by Hill, Norman & Beard, of London, England. On Dec. 12, 1976, a service of re-dedication was held at the completion of a major renovation and repainting of the chancel. The work included extensive improvements in the lighting systems in the nave and chancel. As well, restoration work was again done on the bell tower, and protective panels were placed over the stained-glass windows. A smoke detection and fire-alarm system was installed throughout the church and parish house. Trinity Sunday, May 21, 1978, marked the sesquicentennial of the organization of the parish. Also, on Sept. 9, 1990, a Centennial Celebration was held, marking the 100th anniversary of the consecration of the current church building. On Feb. 10, 2000, Trinity was awarded a $328,150 matching grant from the New York State Office of Parks, Recreation & Historic Preservation through the Clean Water/Clean Air Bond Act. The grant made possible the restoration of the church’s landmark bell tower (steeple). On June 30, 2000, Trinity Church and Parish House together were listed on the National Register of Historic Places. In 2008, a capital campaign was launched to match a $1 million gift from Richard R. and Mary H. Macsherry for the purpose of building a new energy-efficient parish center. Ground was broken on Sept. 13, 2009, on the north side of the church at Stone and Sherman streets. The Rt. Rev. Gladstone B. Adams III, then Bishop of Central New York, dedicated the building Oct. 17, 2010, as Macsherry Parish Center, and the use of Trinity House was discontinued. In February 2011, Trinity House suffered severe damage when heavy rain and a massive thaw caused roof and wall drains to fail. This damage, plus subsequent deterioration, led to the demolition of the building in June 2017. Also in 2008, St. Paul’s Episcopal Church, which was founded in 1867 in Watertown, began the process of merging with Trinity. 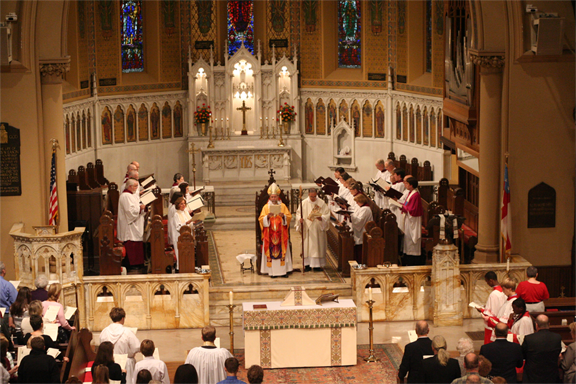 St. Paul’s last service at its church building at Sterling and Clay streets, was Aug. 30, 2009, and was attended by many from Trinity Parish. The majority of St. Paul’s membership thereafter joined parish life at Trinity as the merger process continued. As plans for the sale of St. Paul’s building were being made, the Fred H. Peterson Memorial Columbarium was moved to Trinity Chapel from St. Paul’s in December 2009. In honor of the people of St. Paul’s, Trinity Chapel was re-dedicated as the Chapel of St. Paul on Nov. 9, 2011, by Bishop Adams. 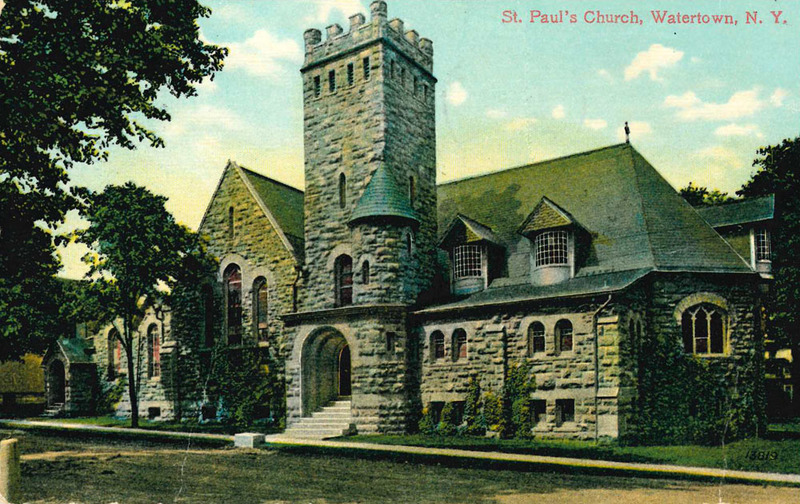 St. Paul’s church building was eventually sold, and on May 16, 2013, the merger of St. Paul’s and Trinity churches was completed.